DULUTH, Minn. — The University of Maine men’s ice hockey team was defeated by No. 2 Minnesota Duluth 8-2 on Friday night at Amsoil Arena in the Black Bears’ first road game of the 2018-2019 season. First Goal (1-0 UMD): Minnesota Duluth scored the first goal of the game. Nick Wolff was left unmarked in front of Maine’s goal. 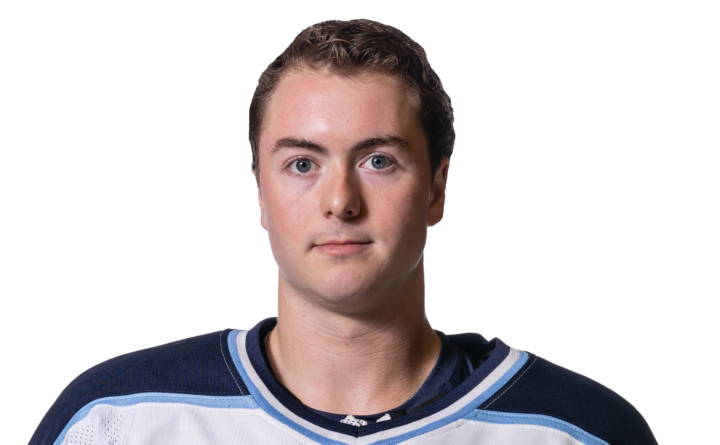 Kobe Roth contemplated about taking the shot from the faceoff circle but, instead, found his teammate in the Black Bears’ crease. The Bulldogs led 1-0 2:51 into the first period. Second Goal (1-1): Brady Keeper went bar down for the Black Bears’ first goal of the contest. The defenseman was waiting patiently at the top of the far-side faceoff circle. Mitchell Fossier cycled the puck to Alexis Binner who found his linemate ready for a one-timer. Maine tied the game with 12:11 to go in the period. Third goal (2-1 Duluth): Scott Perunovich wasted little time regaining the lead for his squad. The goal materialized from a flurry of Bulldog shots. Keeper took a penalty while trying to clear the zone for his goaltender. After the penalty was called, Perunovich fired a wrister that found its way over Jeremy Swayman’s shoulder 9:24 into the period, and Minnesota Duluth grabbed a 2-1 lead. Fourth goal (2-2): After defending an attack from the Minnesota Duluth offense, Tim Doherty found himself all alone in the open ice. The forward stole the puck from a Bulldog defenseman, made a move on the opposing netminder, and tied the game. The unassisted goal came at the 11:38 mark. Fifth goal (3-2 Duluth): The home team would end the period with a one-goal advantage in thanks to a Peter Krieger goal. As was the case with their second goal, this tally was the benefactor of a scrum in front of Swayman. The Maine defense initially made the stop, but the Bulldogs kept pushing and forced a goal into the net. Sixth Goal (4-2 Duluth): At the beginning of the second period, the Maine defense was trying to clear a puck from behind its own net. Tanner Laderoute intercepted the clear and scored an unassisted goal 9:02 into the second. Minnesota Duluth extended the lead to 4-2. Seventh Goal (5-2 Duluth): Originally ruled “no goal,” Parker Mackay slid into Brady Keeper and Jeremy Swayman. The puck managed to find its way through Swayman’s pads and over the line at 15:06 into the period, and the Bulldogs held onto a 5-2 advantage. Eighth Goal (6-2 Duluth): As Rob Michel’s holding penalty ended, Duluth scored its third goal of the period. Mikey Anderson took advantage of the four-man defense as he gave his squad its sixth goal of the night. Ninth goal (7-2 Duluth): Only 17 seconds later, the Bulldogs scored again. Scott Perunovich quickly reversed direction and played the puck ahead to Nick Wolff. Wolff dished the puck to Justin Richards, who was crashing the front of the Maine net. Richards did the rest. Minnesota Duluth and Maine headed into the break with the Bulldogs leading 7-2. 10th goal (8-2 Duluth): With time still remaining on a penalty from the second period, Riley Tufte found the back of the net 24 seconds into the third. The 8-2 lead would stand for Minnesota Duluth. Notes: Jeremy Swayman played the first two periods in net for the Black Bears. The sophomore tallied 25 saves, while Stephen Mundinger finished the game in goal and turned away 13. Maine went 0-for-4 on the powerplay, while Duluth went 1-for-4. Next: The Black Bears take on the Bulldogs on Saturday at 8:07 p.m.